New Look Horseshoe ring set with diamonds with a twist of contemporary fashion. Here is neat new look on how you see horseshoes. The horseshoe is laid over the side of your finger instead of your typical upright design you normaly see. This can pass for fashion jewelry or horseshoe jewelry. Horseshoe is set with diamonds down in the metal for a smooth finish and safe secure setting. Indulge in the finer side of horseshoe jewelry! Dimensions: 12mm wide at the top ring tapering down to two 2.5mm shanks. 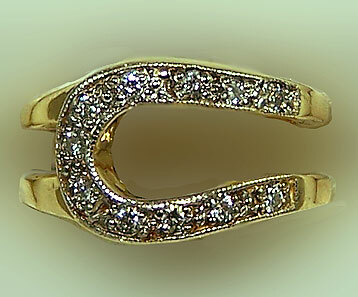 Horseshoe is set with eleven 1.7mm matching diamonds. Diamond weight is .23ct. Have this ring made in your size and set with any gemstones of your choosing today! Just let us know what you would like by using the comments box below.